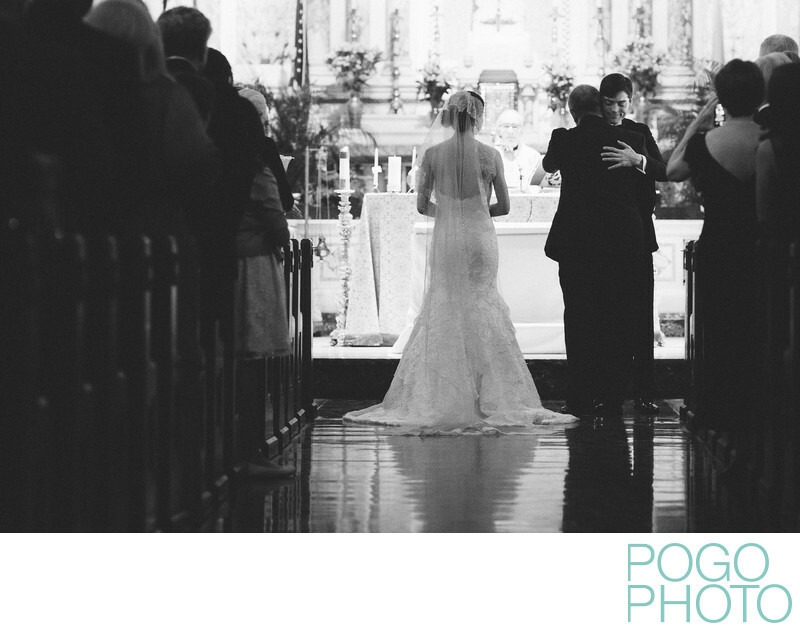 Catholic weddings are amongst the most challenging church weddings to photograph due to their restrictions on imaging professionals moving around during the ceremony, but there are still many ways to create compelling imagery. The flood lighting from the altar at Gesu Catholic Church in downtown Miami allowed us to create a near silhouette, with light conveniently reflecting onto the groom's face while he hugged the bride's father. The groom's sweet smile and his bride's slightly inclined head as she waited for him to join her to be wed tell the story of this image, with the surrounding guests huddling close around them as silhouetted pews. Choosing to expose for the couple rather than for the priest at the altar kept this exposure dark and moody, appropriate for an image from an evening ceremony in winter, with the brightest point being the near future, during the couple’s marriage vows. The sheer veil of the bride’s mantilla and simple updo softens her bare shoulders, while the slight mermaid shape of her lace wedding gown adds curve and feminine sweetness to contrast her pointed elbows. The reflective floor seems almost like a pool of water with rippling waves, and the stark lighting provides multiple points of interest as the viewer’s eye moves around the image. Location: 118 NE 2nd St, Miami, FL 33132. 1/250; f/3.2; ISO 6400; 135.0 mm.